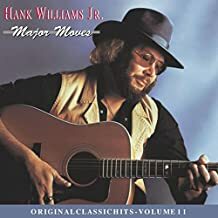 Hank Williams Jr. lyrics and chords are intended for your personal use only, Hank is a very talented man with many great songs, maybe these lyrics and chords will help you enjoy his music. Hank Williams Jr. began his career imitating the music of his famous father Hank Sr. The style of his music evolved over the years with a blend of country, rock and blues and he enjoyed huge success in the 1980's. Still very popular today he is a leader in the country and outlaw country genres. Not only is Hank William's Jr. a great singer he is a skilled musician on the guitar, bass guitar, upright bass, steel guitar, banjo, dobro, piano, keyboards, harmonica, fiddle and drums. A true talent to say the least.